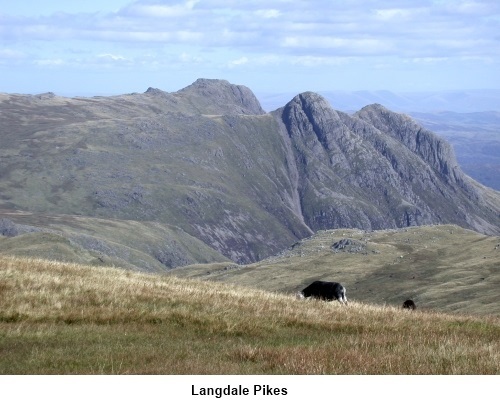 Introduction: This is a superb if quite tiring walk which takes in views of Scafell Pike, Great End and the Langdale Pikes as well as providing some very pretty spots at Stockley Brodge and Sprinkling and Styhead Tarns. Start: The walk starts at Seathwaite (NY 235123), the end of a cul de sac road from Seatoller on the B5289 from Keswick to Buttermere and eventually Cockermouth. There is verge parking but it gets very busy at peak times not least because this is also a popular route to Scafell. Walk to the end of the road and through the farmyard. Just beyond the farm, ignore the left turn to High House and continue to follow the main track. Ignore a path to the left which follows Hind Gill. 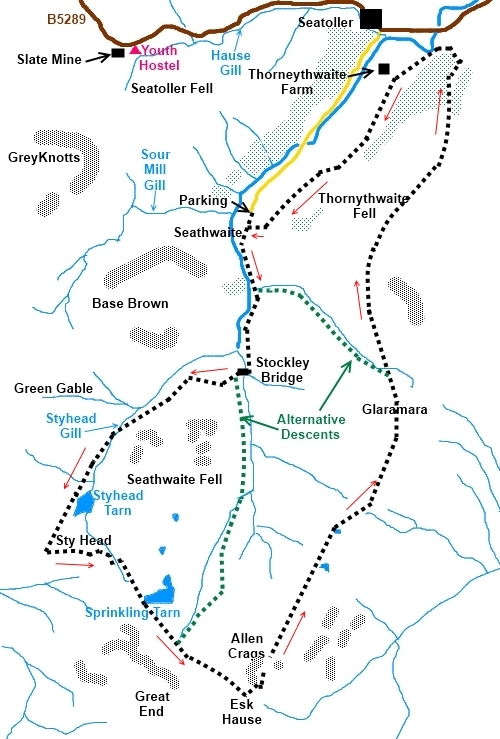 This path is one of the alternative routes down from Glaramara should you need it (shown as a green dotted line on the sketch map). 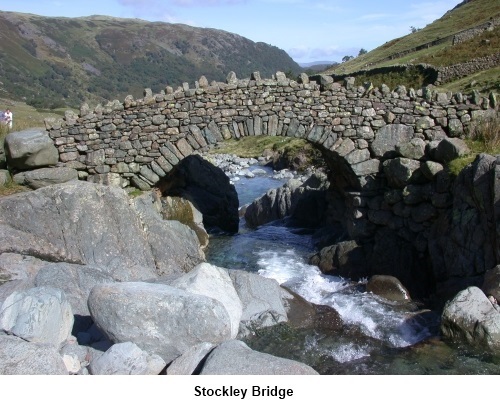 At Stockley Bridge (NY 235109), a pretty stone arched bridge designated as a grade one listed ‘building’, cross the bridge, ignoring the track to the left immediately after it which follows Grains Gill. This is the other alternative descent from just after Sprinkling Tarn. The track now climbs steadily following Styhead Gill. Cross by the footbridge (NY223102) and continue the path until it reaches Styhead Tarn (NY 221100) a lovely spot. 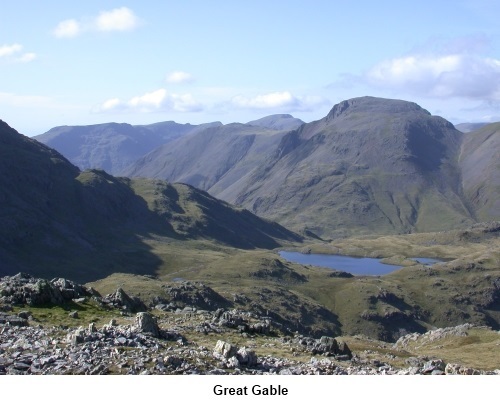 To the north west, the bulk of Great Gable dominates. 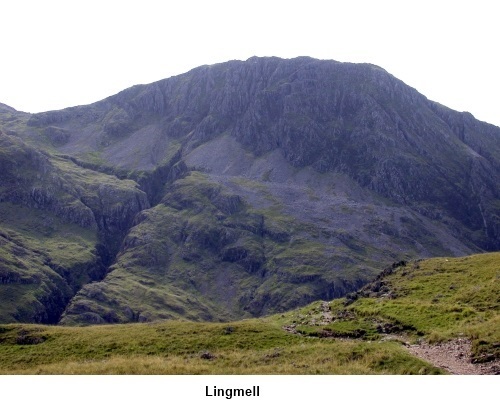 Scafell Pike is to the south. A quarter of a mile beyond the end of Styhead Tarn, turn left by the stretcher box (NY 218095) and follow the footpath to Sprinkling Tarn, ignoring a path to the right. Just beyond Sprinkling Tarn, a left path (NY 229087) is the other alternative path following Ruddy Gill then Grains Gill back to Stockley Bridge. Beyond Sprinkling Tarn, the main path leads to Esk Hause (NY 235083) where there is a crossroads of paths and you get views easterly to the Langdale Pikes. Our route turns left here and climbs steeply to Allen Crags. 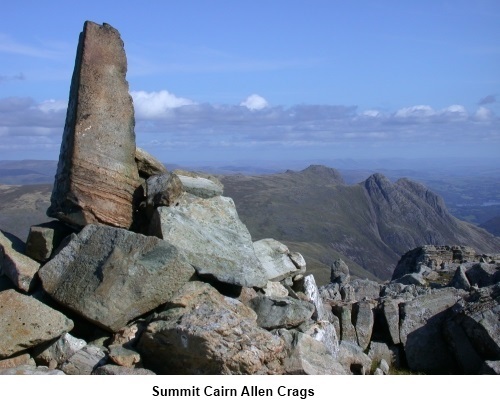 From the summit of Allen Crags (NY 237085), the route heads north easterly, passing some small tarns until after one or two frustrating false summits you arrive at Glaramara (NY 247106). 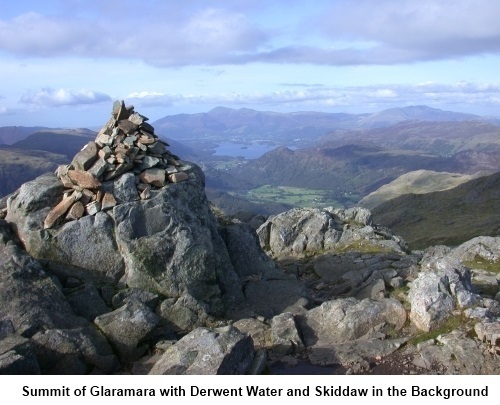 From here are superb views across to Derwentwater and Skiddaw. The path now steeply descends slightly west of north before curving right round Raven Crag and follows Comb Gill to a copse of trees before arriving at Strands Bridge (NY 250135).Turn left here to follow the Allerdale Ramble path back to Seathwaite.